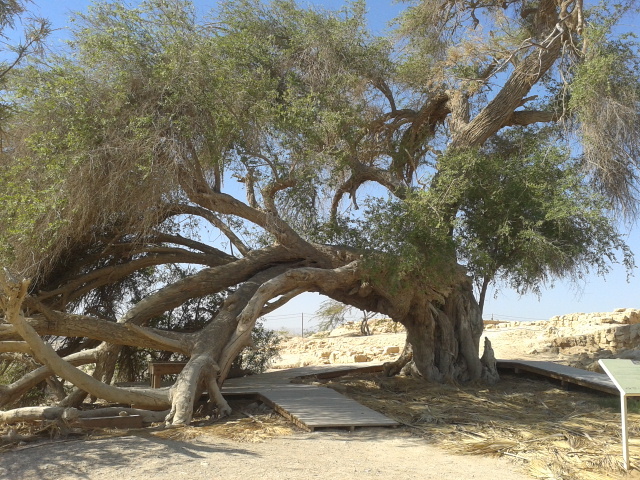 At Ein Hazeva junction on Road 90, 20 km south of the Dead Sea and 150 km north of Eilat, sits a little-known site known alternatively by the names “Biblical Tamar” and “Ir Ovot”. Although, as we shall see, neither of these names may be accurate, the site is very interesting nonetheless. It is easily accessible to anyone traveling to Eilat on this road, and is worth visiting if you are ever in the area with a few minutes to spare (especially because there is no entrance fee required). but the large jujube tree that still grows there is testimony to its existence). Let’s go down into the archaeological site layer by layer. As we descend, we’ll be able to peel away thousands of years of history, and ultimately connect with a few of the key figures described in the Bible from the First Temple period. We’ll start at the top. The first building we see here is a white modern structure, less than 100 years old. This was used during the British Mandate by the “Camel Police” who patrolled the desert. Twice each week, an officer stationed here would set out on a patrol on camelback, traveling south on the road until he met an officer he who made the journey north from Um Rashrash (today’s Eilat), and then return to his post. Apparently, even in the not-so-distant past, this site was very isolated! As we descend into the older remains, we find remnants of settlement in the early Moslem period, a Nabatean outpost that formed one of the stations on the desert Spice Route, as well as some earlier Roman ones dating from the era of the Emperor Diocletian. Beneath these ruins, excavators uncovered remains from at least two separate points during the First Temple period. It’s important to understand that the borders of Jewish settlement were usually much further north (the Biblical phrase “from Dan to Beer Sheva” comes to mind – Beer Sheva is over 50 km north of here), so if a Judean king established a fortress or outpost here, this means he was a powerful king who had both the interest and the ability to reach deep into the Negev desert towards the Red Sea port of Eilat. 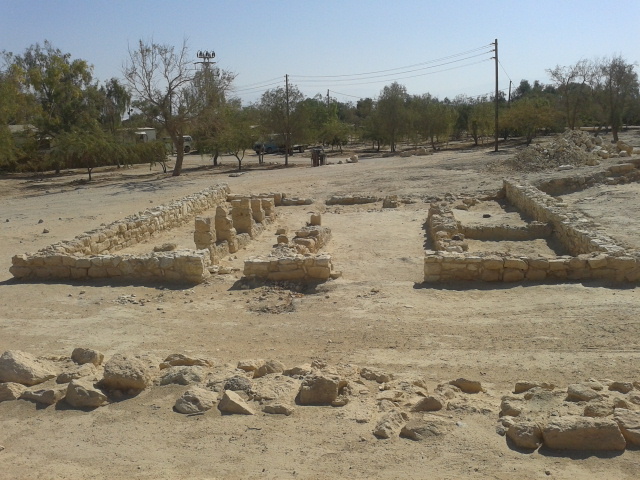 The later remains at the site include this typical Israelite house, dated to the time of King Yoshiyahu. Fascinatingly, nearby there are remnants of an Edomite pagan temple. The idolatrous figurines that were found here (some of which are on display at the Israel Museum) show signs of deliberate destruction. This may well be physical evidence of Yoshiyahu’s heroic campaign to stamp out pagan worship from among the people, in his desperate attempt to prevent the approaching destruction predicted by the prophets (see II Melachim 23:4-15). Beneath this layer there are even older remains, dated to either the time of King Amatzia, who fought a war against the Edomites who lived here (II Melachim 14:7), or King Uziyahu, who built a port city at Eilat (II Melachim 14:22). Although no remains have yet been found here from his time, we know of an earlier king who also built a port at Eilat – none other than King Shlomo himself (I Melachim 9:26)! 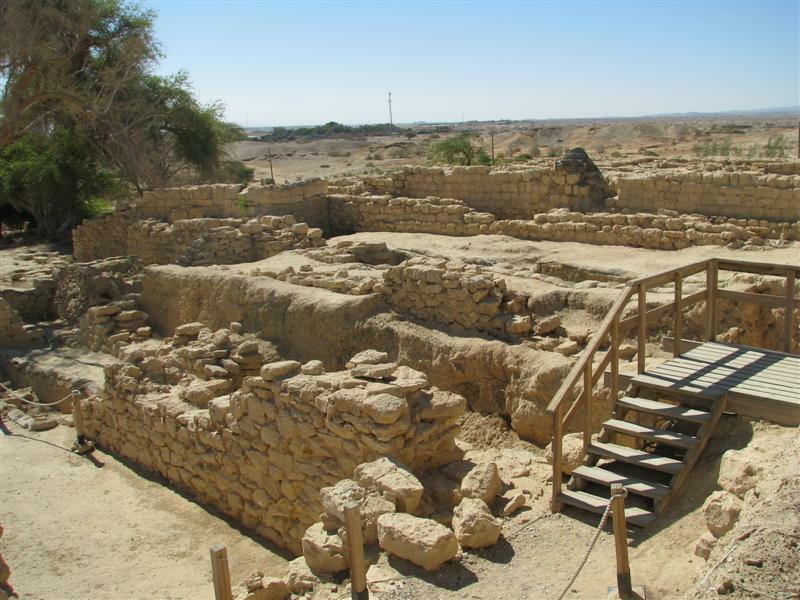 Some researchers believe that this site is the place called “Tamar Bamidbar” (literally, “a date-palm in the desert”) built by Shlomo (I Melachim 9:18). Others have suggested identifying this site as Ovot, one of the places that the Israelites camped in during their 40 years of wandering in the desert (Bamidbar 21:10, 33:43), although this association is problematic. If it is correct, though, then we are touching an even earlier period in our history, and that would mean Moshe Rabbenu himself was here. There’s also one more time period associated with Jewish settlement in this area, and that is our own generation! Today, although still somewhat remote, this region is far from deserted. The agricultural settlements of the Central Arava Regional Council, home to just over three thousand Jews, are in this immediate vicinity. These small settlements, whose exports provide Europe with substantial quantities of certain types of vegetables and make up 60% of Israel’s total agricultural exports, represent one of the most amazing examples of Israelis “making the desert bloom”. The water for those settlements and farms comes from the same source as the Ein Husub spring that supplied the outposts here. As in the times of the Bible, Jewish presence here deep in the desert is a sign of a particularly successful period of connection between Am Yisrael (the Nation of Israel) and Eretz Yisrael (the Land of Israel). Coming to this spot and learning a bit of Torat Yisrael connects us with our past and present, and helps us build our future. This entry was posted in Uncategorized on November 29, 2013 by rabbihaber. I’m pleased to announce a new feature on this blog, which will appear in addition to the type of posts I’ve been writing until now. The new feature is called “Torat Ha’aretz” (the Torah of the Land), and will be dedicated to exploring the unique and wondrous Land of Israel from a Torah perspective. In mind, there are actually two different aspects to the “Torah of the Land”. First, there is the fact that the opportunity to live in and explore the Land of Israel (and to conduct archaeological excavations and other forms of scientific research) enables us to understand the Torah better. There are numerous examples of this phenomenon, and one that I am fond of quoting is from the Torah portion we read last week in the Synagogue. Unable to reconcile the apparent contradiction between those two verses, Rashi concludes (based on a Midrash) that the phrase “Emek Chevron” must be a metaphor, referring to the “deep counsel of the righteous one who is buried in Hebron”. According to this interpretation, the expression indicates that Yosef’s journey to the North, which set into motion the descent of the Children of Israel to Egypt, was the fulfillment of the Divine prophecy previously revealed to our forefather Avraham. 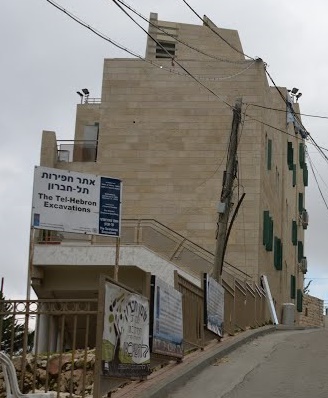 When I take people to Hebron, I am fond of bringing them to the rooftop of a building known as “Bet Menachem”, in the Tel Chevron/Tel Rumeida neighborhood. This apartment house is built on top of excavations revealing ruins over 4000 years old. 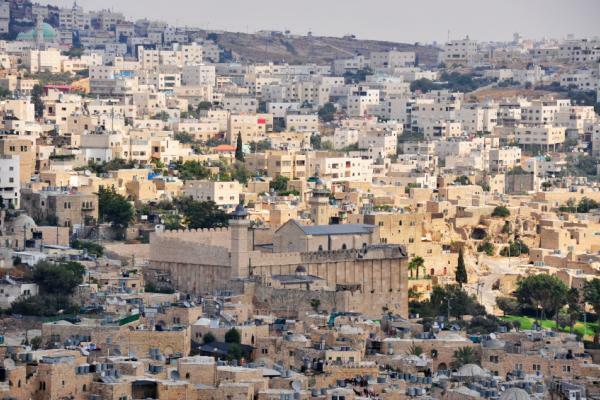 This is the city where Yaakov lived, and as indicated by the verse in Bamidbar, it is indeed on a mountain. From atop the roof, one has a clear view of Ma’arat HaMachpela/the Cave of the Patriarchs, in the valley below. 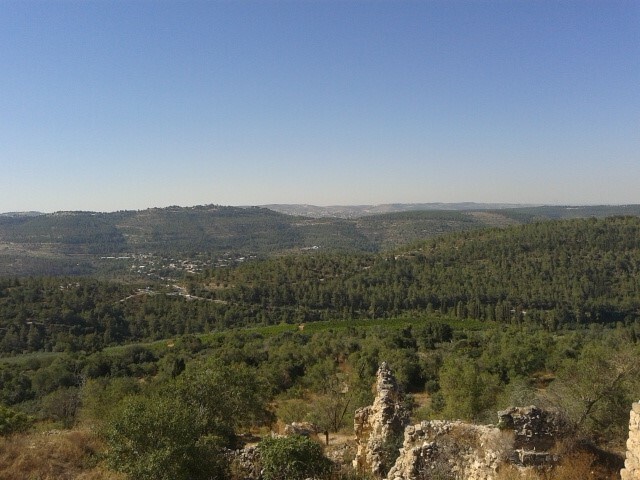 That’s the “Valley of Hebron” referred to in Bereishit. Rashi never had the privilege that we have, to stand in this spot. Doing so enables us to gain a deeper insight into the Midrash that Rashi quoted; Hebron is on a mountain, and there is also a Valley of Hebron. That valley is where “the righteous one” who received the “deep counsel” is buried. When the Torah says that Yaakov sent Yosef from the “Valley of Hebron”, the expression has two levels of meaning. Yaakov apparently escorted Yosef out of the city to the valley below, and it was from there that he sent him on his journey. Unbeknownst to Yaakov at the time, though, he was not merely sending him on a routine trip beginning in the Valley of Hebron, but on a meta-historic journey into exile and redemption from which the People of Israel would ultimately emerge, fulfilling the “deep counsel of that righteous one who is buried in [the Valley of] Hebron”. There is also a second aspect to the Torah of the Land. In addition enabling us to better understand the texts of the written and oral Torah, the land also teaches us Torah on its own. The Land of Israel is an extremely fascinating place. It is geographically situated at the crossroads of three major continents, and in an extremely small space contains unique geological phenomena, a rich variety of topographical and climate zones (where else can you go skiing in the snow, swimming at a beach and hiking in a desert all on the same day, without using an airplane? ), providing habitats for a wide variety of plants and animals (many of which are the basis of images used in the Bible) and some of the world’s most ancient civilizations. It’s also been the destination of pilgrimages by people of various faiths, battles of armies and empires, and the forum for the incredible story of the rebirth and renewal of the Jewish people in the State of Israel. The Land itself has lessons to teach us, and by studying it, we can learn a different form of Torah Ha’aretz. Each of these posts will briefly examine a site or aspect of the land of Israel, and point to aspects of Torat Ha’aretz we can learn from them. The first one is coming, b’ezrat Hashem, later this week. I hope you enjoy! This entry was posted in Uncategorized on November 26, 2013 by rabbihaber. NOTE: As can be seen from the date below and the content of the post, I wrote this originally in November 2013. In October 2014, a few days after the arrest of Rabbi Barry Freundel, I posted it again on my Facebook page. An intense conversation ensued with a number of my friends making some very salient comments. As a result, I realized that the original post was not nuanced enough – so I have now added a few additional sentences. Those added sentences appear below in this green color. Today was a sad day for anyone who cares about the honor of Torah. This morning’s news reported that former Chief Rabbi Yona Metzger was arrested on suspicions of accepting bribes, and of a list of other serious offenses including fraud, money laundering, breach of trust, obstruction of justice and witness tampering. Of course, the rabbi has not even been indicted yet, and certainly not convicted, so we must be careful about drawing conclusions. In addition (and this is itself a sad statement about the current state of the rabbinate), I don’t know too many people who actually viewed Rabbi Metzger as any type of halachic or spiritual leader. Nevertheless, the sight of someone who represented Torah to Israel and the world being led away into police custody is extremely disturbing. This incident comes on the heels of a number of other disturbing incidents in recent months and years involving high profile rabbis caught committing various types of sins – some of them criminal offenses, and some not. Unfortunately, the list is not very short, but a few that come to mind are Rabbi Michael Broyde of Atlanta, a prominent rabbinic judge on the Beth Din of America who was caught using fake internet identities to dishonestly promote himself and his scholarship; Rabbi Mendel Epstein of Brooklyn, who was arrested a month ago on accusations of charging women tens of thousands of dollars in order to help them receive a get by hiring thugs to torture their recalcitrant husbands; and Rabbi Motti Elon here in Israel, who was convicted this past summer of indecent assault against two minors. These extremely unfortunate incidents cause a huge amount of damage, in a number of different ways. Besides the direct damage they have caused to specific individuals, and the general element of Chilul Hashem (desecrating God’s name) they cause, there is something else that often escapes attention. Many of these discredited rabbis were talented leaders, and their indiscretion robs the community of the opportunity to continue benefitting from their scholarship, leadership and whatever else they did that brought them to their exalted positions in the first place. Of course, the responsibility for this tragic state of affairs rests on the shoulders of the offending rabbis themselves – through their violations of halacha and ethics, they brought about all of this destruction, and they must be held accountable. The question, though, is whether the damage can ever be reversed. Must every scandal always be a career ender? Hypothetically, if these disgraced rabbis would apologize and express remorse, could it ever possible for them to be forgiven and continue to lead us? Can someone who has committed serious offences ever regain our respect and admiration? At first glance, the answer should be no. Although we believe in the power of repentance and might be able to overlook past indiscretions on the part of our friends and neighbors, we expect more from our leaders. They have to be people of impeccable character; this is what makes them worthy to lead us. Indeed, this seems to be the view of Rabbi Yochanan, quoted in the Talmud (Chagiga 15b) as saying that in order to be worthy of teaching Torah, a rabbi must be comparable to an angel of God. On the other hand, a different statement of Rabbi Yochanan (Avodah Zara 4b-5a, in the name of Rabbi Shimon bar Yochai) tells us otherwise. If someone is unsure of the power of repentance, he says, he should look to the example of King David, who “raised up the yoke of repentance”. According to the Bible (II Shmuel 11-12) King David was guilty of some of the most severe crimes possible – adultery and murder. He was accused of these crimes by the prophet Natan and sentenced to multiple punishments involving very severe suffering for many years. But he wasn’t removed from his position. In fact, not only did he rule the Jewish People for the rest of his life, but he was promised that his descendants would continue to rule forever. And he leads us not only in spite of the fact that he sinned, but to a large extent because of it. Some of his most inspiring psalms were written as a result of his feelings of anguish for what he did (e.g., Tehillim 51) and of the tragedies he suffered as a result (e.g., Tehillim 3). Yes, Rabbi Yochanan teaches us that our rabbis must be like angels, but he also teaches us that King David is our role model because he sinned and repented. Apparently, one can become like an angel even after committing very serious crimes. Therefore, I would like to call upon each and every one of these rabbis who have been found guilty of any type of wrongdoing, to follow David’s example, admit his guilt and accept responsibility. This is not going to be easy. Among other things, it will require them to publicly accept guilt and apologize, and to make amends to the offended parties as much as possible. Very often, it will also require at least temporarily being removed from positions of honor and influence. In cases where they have committed criminal offenses, they must also cooperate fully with law enforcement and – after due process – accept the justice of whatever sentence they are given, and serve it with dignity. The rabbi will need to convince the community that he is serious about repenting, and is willing – like King David – to pay the price for his offences, doing whatever is necessary, for as long as it takes, to convince us of their genuine sincerity. If and when that happens, though, I suggest we make clear that we will be willing to take them back as rabbinic leaders, but only if we are confident that appropriate safeguards are in place to make sure they don’t repeat their crimes. Many times – certainly in the case of sexual offenders – they must permanently remove themselves from any position involving direct contact with students or congregants. But if they have done everything described above, even they could still contribute in other ways, for example by writing articles. Sadly, I don’t see too many instances of disgraced rabbis acting this way. They generally continue to maintain their innocence or at most acknowledge some minor errors of judgment. Undoubtedly, this is largely because it is very difficult for anyone to publicly admit guilt and suffer the huge embarrassment this entails. But perhaps it’s also because they know that their only chance of salvaging their careers is if they could somehow convince people that they aren’t guilty at all. In our current culture that expects our rabbis to be perfect saints, there’s simply no room for public repentance. If we make clear as a community that we are willing to be led by those who follow in the footsteps of King David, maybe we’ll be able to encourage some people to take those difficult steps. If they do, then when a great rabbi makes a great mistake, we won’t necessarily have to lose a great leader. Maybe at least one of them will rise to the challenge and own up to his errors. If he does, perhaps we’ll be able to continue learning from his Torah. And more importantly, he’ll teach us all an important lesson about how to repent. I am well aware of the various rabbinic interpretations suggesting mitigating circumstances according to which David was not actually guilty of those specific offences. There are also other views in the Talmud that say that in fact he was guilty of exactly those crimes, and of additional ones as well. But since that discussion is not the focus of this post, I began my sentence with the phrase “according to the Bible”. The plain sense of the Biblical text is certainly that David committed adultery with Batsheva and then sent her husband to his death in order to cover up his crime. If he did not actually do these things, the Bible apparently wants us to understand that whatever he did do was, in his case, just as bad. This entry was posted in Uncategorized on November 19, 2013 by rabbihaber. For the past week, like many others, I have been closely following the tragic story of Gital Dodelson and Avrohom Meir Weiss, since the story of their troubled marriage and divorce proceedings was publicized last week in the New York Post. The story, and efforts to help Gital receive a get, have spread far and wide largely due to facebook and other social media, and in just a few days seems to be producing results. An immediate focus of the campaign was to pressure Artscroll Publishers to fire Weiss’ father and uncle, who occupied prominent positions in the company and also supported Weiss’ refusal to give a get to Gital. It seems this effort has produced some results as Artscroll released a copy of a letter by these two individuals yesterday, suspending themselves from their positions “until the situation is resolved”. From the perspective of Gital and her supporters, this was an important victory. Because of their desire to harness public opinion to support their respective positions, both sides have published detailed arguments and supporting documentation on the internet. Avrohom Meir’s primary argument and documents are available here, and there have also been updates in several posts on this blog, and Gital’s can be seen on her website (see the “Documents” and “Refuting” sections). By reading these materials, we can all understand the details of their dysfunctional marriage and the legal battles they are waging both in New Jersey secular courts and in rabbinic courts (battei din). While it is unfortunate that such painful and private matters have been revealed to the public, this affair does give us a rare window into an actual case of an aguna/mesurevet get , and I think there are some important lessons to be learned from it. Gital is right and Avrohom Meir is wrong. He needs to give her a get immediately and unconditionally, and without any connection to any other ongoing disputes between them. Until such time as he does, any (non-violent, legal) measures any of us can take to pressure, embarrass and humiliate Weiss and his supporters to get them to comply are legitimate. This is sad, but it is the clear, indisputable and halachically correct conclusion. Some people feel that ANY woman who wants a get is entitled to it immediately, no matter what the circumstances, and that the husband is automatically wrong in such disputes. Personally, I think things are more complex and would not make a blanket statement like that. In this particular case, though, she is in fact completely right and he is completely wrong. I make this claim first of all because it is clearly stated in a letter (English translation here) signed by many extremely prominent American rabbis. Contrary to implications by the Weiss camp, the rabbis signed on this letter (with the exception of Rav Hershel Schachter) are not affiliated with Yeshiva University, but rather with the “right-wing/yeshivish” community to which both Weiss and Dodelson belong. Additionally, there is an official ruling by a prominent rabbinic court that declares Weiss in contempt of court. And finally, after spending a few minutes reading the arguments and documentation of both sides, it is absolutely clear that the Weiss camp is spreading lies and misinformation, and even submitted a forged halachic document to the court. It isn’t hard to see that. They have made a number of claims that are clearly and plainly refuted by documentation published by the Dodelson camp, and in at least one case by a Hebrew-language document that they posted themselves (document “F”). The most recent example of this is the resignation letter mentioned above, in which Weiss’ father and uncle assert that “we had agreed to arbitration”, implying that there had been an agreement. They also released a letter from the supposed arbitrator claiming to back up this claim. However, the Dodelsons then obtained and publicized an email from that same individual clarifying that they had never agreed to arbitration at all! These situations have to stop! The publicity generated by this case, and the revelation of details and documents, enable all of us to get an “inside look” at the anatomy of an aguna case, perhaps more than other high-profile cases have done. Even after, with God’s help, Gital receives her get and moves on with her life, we will still be left with many other such cases, and with a system that enables this to happen again and again. This is a tragic situation, and as a community, we should not allow it to continue. Some Orthodox rabbis and spokespeople throw up their hands and say “what can we do? This is God’s law, and there’s nothing we can do to change it.” On the other extreme, there are also voices in the Orthodox community arguing that (to use Blu Greenberg’s famous phrase) “where there is a rabbinic will, there is a halachic way”, and that if rabbis really cared, they would solve this problem once and for all. Both of those extreme statements are partially true, but also partially false. It is, in fact, the case that according to Torah law, the only way for a married couple to be divorced is if the man gives his wife a get, and that can’t and shouldn’t be changed. And this means that, tragically (for reasons that I for one cannot understand), there may always be situations in which a woman who is no longer living with her husband may be unable to remarry. But at the same time, there are many halachically acceptable solutions that can greatly reduce the frequency of these tragedies, and can deprive recalcitrant husbands of the ability to abuse their wives by withholding a get in defiance of a bet din. This is not the place (and I am not the person) to discuss various innovative halachic devices that have been suggested, but one thing that any couple getting married can and should do is to sign a halachic prenuptial agreement (available here for couples living in the USA, and here for Israel). If Gital Dodelson had demanded this agreement she probably would have had her get years ago. If every couple getting married, without exception, signs one, this problem will be virtually eliminated. Social Torah? As stated above, I hope and pray that Gital Dodelson receives her get very soon. Based on early impressions one week after this story went public, I think there is a decent chance that she may actually win this one, with the help of God. It is quite instructive to contemplate how she accomplished this. Apparently, the Dodelsons hired a professional consultant to maximize use of the internet and social media to gain support for her cause. We are already seeing the results of that effort. I don’t blame the Dodelsons for taking this approach – when your opponent is using illegitimate methods against you, you have to use any legitimate tools that you have. At the same time, though, as a community we ought to consider how much and under which conditions we want to allow the use of social media to determine policy and results. The internet and social media are powerful tools that have made incredible contributions towards the dissemination of Torah – but like all media, we need to be careful how we use them. Social media’s power is its breadth of reach, but its weakness is its lack of depth. I wrote above that I concluded that Gital is right and Avrohom Meir is wrong because I read all of the documentation available in the case. Due to the internet, I was able to find and read all of the relevant arguments and documents from my own living room, and the whole thing took me about 15 minutes. But how many other people read all of those documents? Judging from comments on various websites and from the Weiss’ very flimsy (yet apparently somewhat effective) use of misinformation, it seems most people don’t read anything beyond the headlines. If we’re going to use social media, we need to use it responsibly. I urge ANYONE who wants to take ANY action on this case (including signing a petition or joining any sort of protest, or even clicking “like”) to NOT take my word for it. Take the 15 minutes I did and read the information available at the links above, and then draw your own conclusions (if you are unfamiliar with halachic and/or legal terminology some of the technical terms may be confusing to you, but it isn’t very hard to get the basic gist of what’s going on). Also, we must realize that social media can enable the quick and efficient mobilization of significant masses of people supporting a cause, and can be harnessed by common people just as well as (and sometimes more effectively than) rabbinic or other leaders. On the one hand, that can be a blessed phenomenon to empower people like Gital Dodelson who are otherwise powerless and vulnerable. But on the other hand, this same power can and is easily be misused by people with less righteous and holy agendas. I don’t think we want halachic policy and Torah decisions in our community to be determined by whoever is able to muster the most likes on facebook (or whoever hires the most sophisticated media consultant). Social media is an important tool, but we must remember that as a halachic community, our rabbis are still our leaders and halachic decisions, particularly ones on such complex and sensitive matters, must be rendered by qualified poskim (halachic decisors/experts). Discussions of complex halachic matters can take place on the internet, but this has to maintain the high level of sophisticated discourse among Talmidei chachamim, and must not be reduced to blog posts and facebook statuses. We can – indeed must – make our voices heard. Just not too loud to drown out more substantive conversations. This entry was posted in Uncategorized on November 13, 2013 by rabbihaber.